These houses look like big stones. 3D-printed concrete houses are coming to the city of Eindhoven in the Netherlands. Dubbed Project Milestone, the construction project will include five homes built sustainably and energy-efficiently using some of the latest techniques in 3D-printing. The first house will feature floor space of just over 1,000 square feet and walls just under two-inches thick. It will be printed offsite and assembled on location, serving as a sort of default example from which the other structures will take inspiration. The construction teams behind the project hope that by the fifth house, they’ll be able to print the structures entirely on-site. After the first home is constructed, the others will be relatively elaborate, with multiple stories, patios, and balconies. Why 3D Concrete printing? The scheme represents the potential impact of 3D-printed concrete on the construction industry, with the ability to construct almost any shape, with a variety of qualities and colors in the same building element. The process also addresses the environmental impact of construction, with the reduction in cement resulting in a decrease in CO2 emissions. 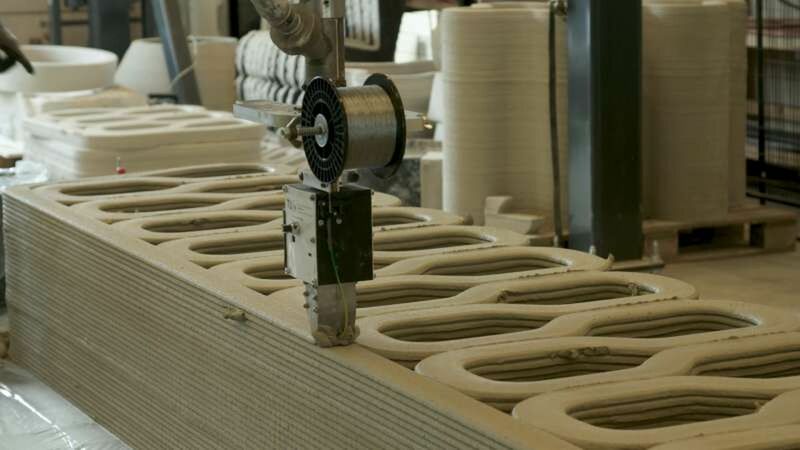 The university says 3D printing of concrete is a potential “game changer” in the building industry. The first stage is scheduled to be completed in 2019, at which point the first residents of the 3D-printed concrete tiny home community will move in.